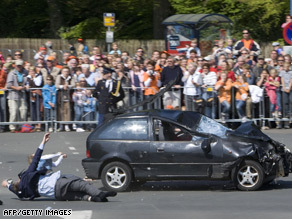 (CNN) -- Five people were killed Thursday after a man tried to attack the Dutch royal family during a Queen's Day celebration by crashing his car near the royal family's bus, Dutch police said. Authorities are not releasing the name of the man, but said they have charged him with with trying to attack the royal family. Twelve people were injured in the incident in the Dutch town of Apeldoorn, about 45 miles east of Amsterdam, police spokeswoman Esther Naber told CNN. Crowds had lined the streets to see Queen Beatrix and her family ride by in an open-top bus during the Netherlands' annual holiday. As the bus moved along, a black hatchback zoomed past it. The crowds were behind barriers off the road, but security officials and journalists, including many cameramen, were in the road as the car went by. The car crashed into the low metal railing around a column on the side of the road. The vehicle appeared heavily damaged even before the crash, but the reason for that was unclear. There was no one other than the driver in the car at the time, Naber said. The driver is in the hospital, badly injured, Naber said. He is among the five seriously hurt -- three men and two women.